You are here: Home » Artificial Intelligence » How Will Artificial Intelligence (AI) Change Magento? What are the most anticipated changes AI can bring to Magento? Need of the understanding of the end users behaviour patterns that can be done easily by the use of AI. Large amounts of data can be analyzed with the help of AI-based programs. AI can provide solutions without requiring any human intervention. In the world of e-commerce where endless user data is available to interpret for providing amazing results, AI can be very helpful. Approximately 19% of Alexa’s top 1 million e-commerce stores are powered by Magento, making it the most utilized e-commerce CMS. Since the market share of Magento is huge, there are promising possibilities. 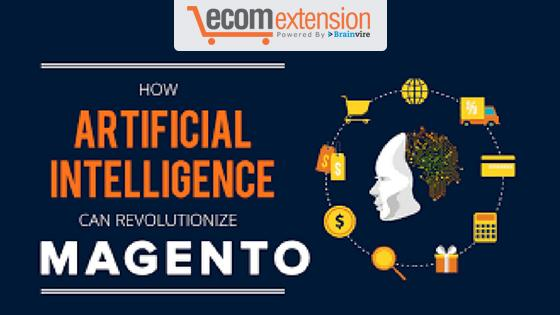 Magento is most talked about by developers for creating Artificial Intelligence driven E-commerce solutions. According to the Gartner, about 80% of the communications with the customers will not be human-mediated by the end of 2020. Likewise, by the end of 2018, digital assistants will recognize the faces and the voices of the customers. AI is making possible shopping experiences similar to in-store shopping for customers in the comfort of their homes. What are the most anticipated changes AI can bring in Magento? Artificial Intelligence in Magento will entirely change and personalize the consumer experiences. For a better customer experience, purchase assistants that are incorporated into AI can be used for reaching the right users at the right time. For humans, this is difficult and next to impossible to analyze the behaviour of the consumers based on their historical data and provide them with personalized assistance. The main functionality of any e-commerce store is the product search and Magento has already some impressive search extensions. AI-powered searches will enhance this to a great extent. The search bar is the first place where any consumer would go to on any site. Virtual purchase assistance is yet to be released but can be sooner or later. Purchase assistant will be able to analyze and monitor e-commerce stores for upcoming deals, new products, and the best feature will be that they can even add products to the cart on your behalf and can even perform the checkout process. Now businesses are exploring the possibility of the visual search with the help of AI. You can take a picture of any product from your mobile camera and then search for similar products. This will make searching extremely easy and nearly instant. A major setback that e-commerce businesses face is online theft and frauds. With the help of AI, false positives will be controlled. Different channels produce multiple risks of fraud in comparison to in-person transactions. Customer support can be better performed with the help of AI. AI Bots provide effective 24*7 customer support service with great precision. These are some most of the common but at the same time most utilitarian and talked about impacts that AI is presumed to have on Magento. There are already a lot of Magento based AI options available in the market. E-commerce giants like Alibaba, Amazon, and eBay take advantage of Artificial Intelligence. This is the right time to think about using AI to your e-commerce business. Its true impact on the commercial sector can only be measured in the near future.